I moved to my new home about 5 weeks ago, and only now have I got an internet connection at home! “Why?” I hear you ask. I get my phone line through the Post Office and they couldn’t get an engineer out any sooner than early November to connect my phone line, and it took BT another week and a half to get the internet sorted out! After many months of waiting, the day has finally arrived! 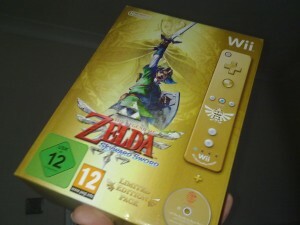 Zelda Skyward Sword for Wii finally hit UK shores! My copy arrived today, a day after the launch (no thanks to Amazon delivering it late).